When there’s nothing to eat and you don’t want to spend a lot of time or energy cooking, a stuffed baked potato is an easy, filling, and affordable option. We took this simple, time-saving idea to a whole new level of delicious with this Barbecue Chicken Baked Sweet Potatoes recipe. 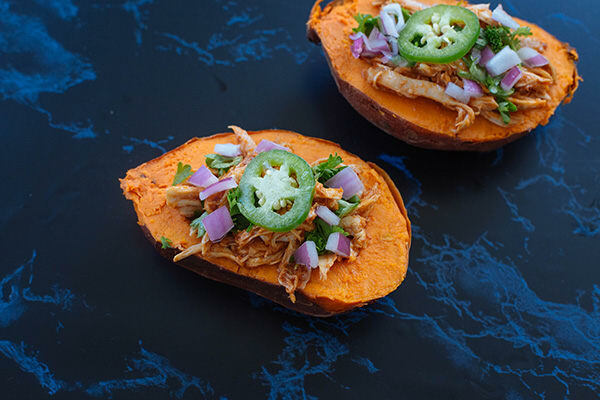 The five ingredients pack a bold punch: baked sweet potatoes are stuffed with shredded chicken that’s drenched in smoky barbecue sauce then topped with piquant pickled onions (or chopped red onions) and fresh parsley or cilantro. If you already have baked sweet potatoes and leftover chicken ready, you can put this dinner together in less than 10 minutes. For a complete meal, serve each baked sweet potato with a green salad or vegetables like broccoli, asparagus or Brussels sprouts that can be roasted on the same baking sheet as the potatoes or steamed in a separate pot. For a lightning-fast meal prep, try this healthy barbecue chicken baked sweet potato recipe. Make sure you’re really hungry when you make them — these puppies are filling.